A terminate pseudostate is an element of a state machine. When a terminate pseudostate is reached, the processing of the events and thus of the state machine is terminated. 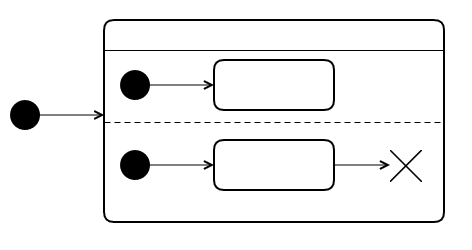 Once the terminate pseudostate is reached no further actions are taken (including exit actions). A terminate pseudostate belongs to region. It has no outgoing transitions. It causes the immediate stop of the processing of events and thus of the state machine. After a terminate pseudostate is reached, the state machine will shut down and will process no further events. This is also applies to new events that are enqueued afterwards or events that are still pending in the event queue. There is no interpretation of and deviation from the UML specification for a state machine's terminate pseudostate.